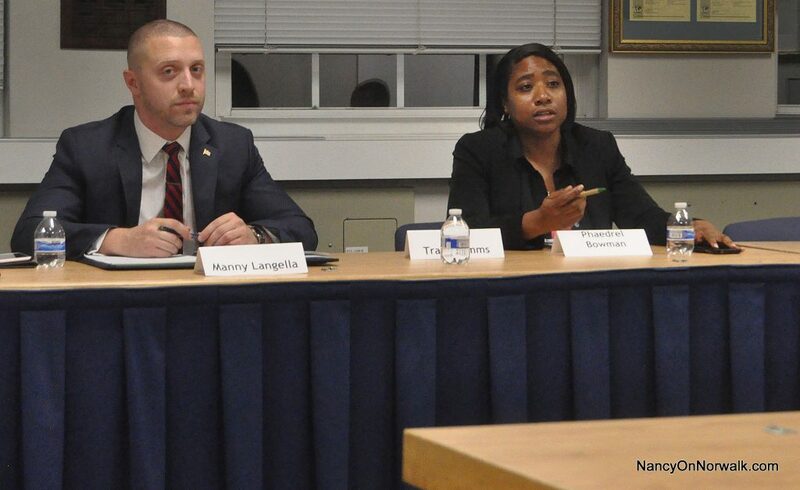 From left, Manny Langella and Faye Bowman talk to the public in October at a Common Council forum in City Hall. Bowman has been a Council member since 2013; Langella was in his second run for a Council seat. Ernie Dumas speaks at February District B Democrats meeting. NORWALK, Conn. – More than one person is hoping to get the Norwalk Common Council seat Faye Bowman will leave behind if she moves out of Norwalk, as she says she is going to do. Bowman, a District B Democrat, said she’d like to see the seat go to South Norwalk activist Ernie Dumas. Manny Langella, who has run for Council twice, has announced a desire for the seat. There may be other people who are interested, District B Chairman Bobby Burgess said Monday. Bowman in late February said she’d probably be leaving Norwalk “pretty soon” because she was looking to buy a house and prices are too high in Norwalk. 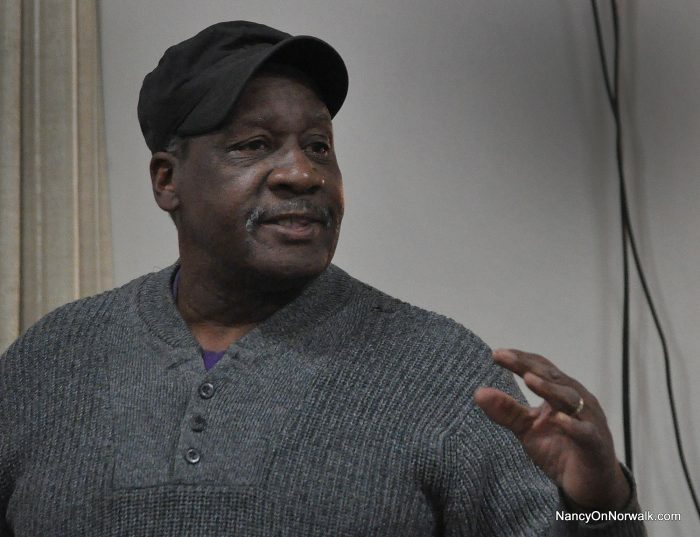 District B is now considering the process to choose a replacement, Burgess said Monday, explaining that he’d hoped to have a “general election,” where anyone can vote, but has found out that it’s up to the 11 Democratic Town Committee members from District B. District B Democrats “in good standing” can vote on recommending a replacement, then send that recommendation to the DTC members, he said. This will be discussed at the May 7 District B meeting, “but nothing will happen until Faye decides to hand in her resignation,” he continued. Dumas is a member of South Norwalk Citizens for Justice. “I understand my name was mentioned for consideration however, I will need to find out what the process is and not go out independently and uninformed,” Dumas said in a Monday evening text message. DTC Chairman Ed Camacho did not respond to a Monday email asking for a response to that comment. “Per the City Charter and past precedent, the DTC picks the replacement, because that was her party affiliation when elected. This makes sense because it avoids the cost of a special election. People from other districts never get to vote for someone to represent District B, or any other district. So it is the 11 members of the DTC from District B who choose. Langella is one of the 11 District B DTC members. Burgess said he’s heard there are other people interested but has not confirmed the rumors. District B members are in “good standing” when they have attended three meetings within the last year, he said, explaining that anyone who has been to two meetings can attend the meeting and be eligible to vote as that will count as the third. Bowman has served as a District B Common Council representative since November 2013. She has lived in South Norwalk for more than 30 years. She declined to say Sunday where she might be moving to and when she might do it. Today is the reporter’s birthday. Happy Birthday Nancy!!!! If ever there was a time for SoNo residents to take a heightened interest now is that time. New Mall is the best chance in a generation for encouraging a new Downtown providing good jobs for City residents. But that will take a very strong community effort to “encourage” City Hall to make a serious effort. Rather than subsidize Developers building apartments for commuters. District B residents are lucky to have both Ernie Dumas and Manny Langella express interest in Faye’s seat. The trick is to take this enthusiasm to the council chambers. With a 14 to 1 democratic majority, it’s easy for B to willt under party pressure. Time for B residents and their reps to demand more from City Hall and the administration. Nancy, hope your birthday was as fabulous as you are! Thanks so much for all you do.